Automatic dialer software automatically dials lists of phone numbers and is typically used in cold calling sales. We looked at a range of auto dialer software and narrowed it down to the top six based on price, features like call analytics and call routing as well as customer support to determine the best overall. Integrate this with your phone systems and you’re sure to have more successful calls. Auto dialer software saves time and money by automating the dialing procedure. Auto dialers play preprogrammed messages to answering machines, route live calls to agents and skip nonserviceable numbers and busy. Auto dialers can increase the call connect ratio, leading to higher agent productivity and increased sales. Based on our research, we recommend ChaseData as the best overall auto dialer for small businesses that need a reliable auto dialer with great customer support at a competitive price. Here’s how the six services we evaluated stack up for price, features and customer support. ChaseData is a leading auto dialer software platform that offers auto dialing as part of its call center package. It’s known as one of the best cloud-based auto dialer solutions on the market with features like inbound call capability, training tools and [customer relationship management] CRM integration. We believe it’s great for businesses that need inbound call center features with outbound auto dialing at a price that’s on par with other auto dialers on the market. ChaseData’s Small Business Edition is a moderately priced $89 per user, per month and includes one voice channel per agent. The Professional Edition is $139 per user, per month and includes four voice channels per agent. The Enterprise Edition is $169 per user, per month and includes six voice channels per agent. ChaseData’s Small Business package includes one voice channel per agent, preview and progressive dialing, inbound calling and call routing, auto attendant, remote agent capability and a reporting package. This tier lacks predictive dialing, trainee mode and Zapier integration included in the Professional Edition and the SOAP-based Salesforce application programming interface (API) included in the Enterprise Edition. You won’t find the lead building and management tools offered by Velocify Dial-IQ or email campaign management tools Voicent has to offer. However, at $89 per user, per month, this tier is the least expensive ChaseData option and more affordable than Velocify Dial-IQ’s or Voicent’s plans, making it a good choice for small teams and startups with low call volume. ChaseData’s Professional Edition adds predictive dialing and a trainee mode for onboarding new agents and Zapier to ChaseData to more than 500 apps. This tier lacks the simple object access protocol (SOAP)-based Salesforce API included in the Enterprise Edition, making Velocify Dial-IQ a better choice if that’s a deal breaker for auto dialer software. You won’t find integration the fundraising CRM integration CallHub has to offer or the turnkey auto dialer and contact center solution of Five9 here. However, at $139 per user, per month, this tier is about even with plans from Velocify Dial-IQ and Voicent. It’s right for medium-sized businesses and companies with high-volume outbound call centers. ChaseData’s Enterprise Edition adds a SOAP-based Salesforce API for the integration government, financial, healthcare and other high-profile sectors need. Six voice channels per agent keep customers connected quickly and efficiently. This tier is an excellent choice for medium to large companies with complex calling needs. At $169 per user, per month, this tier is pricier than Voicent or Velocify Dial-IQ, but it’s still a good value for the bundle of features. ChaseData’s customer support is solid across each tier, with an extensive online knowledge base, support specialist ticketing system, email and fax support and phone support. Unlike Five9 and Voicent, predictive dialing is only available in the higher-priced tiers. PhoneBurner offers CRM integration at every plan level and Velocify Dial-IQ has a built-in lead management tool. If those are features you can’t do without, ChaseData may not be the right fit for your company. ChaseData customer reviews online have positive things to say about the company overall. They report that the auto dialer service is a good value for the money and the technology is easy to use. However, some ChaseData customers report the agents’ screens tend to freeze sometimes. Small businesses that need solid auto dialer software with standard features and good customer support will want to check out ChaseData. The company offers free trials and demos to business owners who want to try before they buy. Check out ChaseData’s website for details. Five9 is a cloud-based contact center solution that doesn’t require expensive equipment to set up and use. Five9’s technology is completely cloud-based so agents can log in from anywhere with only a high-speed internet connection, computer and headset. Five9 isn’t the cheapest option on the market, but it’s great for businesses that want to avoid complex auto dialer setups or solutions that require workers to be at a single location. Five9’s pricing is only available by consultation but is based on usage, features, number of seats and month-to-month vs. annual plan. While Five9 does not advertise their pricing, our research indicates Five9’s plans start around $185 per month, per user. However, as this is only an estimate, businesses should request a quote directly from Five9. Five9’s feature set is appealing to businesses that don’t want to invest time or money in expensive software downloads or equipment. It lacks Velocify Dial-IQ’s lead management tools and PhoneBurner’s business app integration, but agents can plug in a headset, turn on a monitor, log on to the system and get to work. Five9 bundles predictive, power, progressive and preview auto dialers into its outbound call center technology, unlike ChaseData, which charges extra for predictive dialing. PhoneBurner doesn’t offer predictive, progressive or preview dialers as part of its service. Five9’s inbound call center package includes speech recognition, automatic call distribution, interactive voice response tools and on-screen caller information. Like ChaseData, these features are included in the software package. An inbound center call package with similar features is available at Voicent for an additional $15 per month. Each agent has access to a desktop interface that provides visual cues to guide agent actions, chat with customers and engage with customers via email and other omnichannel activities. The intuitive interface reduces training time and reduces agent onboarding costs. ChaseData offers similar built-in tools, but CallHub requires a Zapier integration to activate LiveChat. Five9 integrates with Salesforce, Microsoft, Zendesk, Oracle, Microsoft, NetSuite CRM products and includes a toolkit for building solutions for other web-based CRMs. ChaseData also offers limited CRM integration but only at the Professional and Enterprise tier levels. Five9’s offers an extensive online knowledge base and 24/7 online and phone support. Direct access to the senior support team and a dedicated technical account manager is also available for an additional cost. This auto dialer company has much to offer, but it comes with a hefty price tag. Five9 also lacks the strong lead generation features and CRM integration of competitors like Velocify Dial-IQ, ChaseData and PhoneBurner. Five9 online customer reviews are positive, and customers appear happy with the company. Clients say the service integrates cleanly with Salesforce and the interface is user-friendly. On the downside, some customers say the dialer occasionally freezes up on outgoing calls. Businesses that want a turnkey auto dialer and contact center solution in one comprehensive package should give Five9 a try. Visit Five9’s website for information on demos, data sheets and price quotes. Velocify Dial-IQ is an auto dialer with built-in lead management software designed to boost the productivity of sales teams. The outbound sales dialer integrates into existing phone systems to manage thousands of calls simultaneously. This sales dialer helps sales teams work more efficiently, making it the best auto dialer for lead management. Velocify Dial-IQ’s pricing is only available by consultation. Our research indicates Dial-IQ costs approximately $100 per user, per month, plus 15 cents per minute. Per user, Velocify Dial-IQ’s pricing is approximately the market average. Per-minute calling rates are higher than Voicent’s and about the same as CallHub’s. Velocify Dial-IQ is tailor-made with sales teams in mind. Auto dialer products like Five9 or ChaseData may work in a wide range of office and industries, but Velocify Dial-IQ is designed to deliver the features sales teams need most from an auto dialer software solution, like tailored call routing, call prioritization and live coaching. Call automation is a common feature of contact center software, but Velocify Dial-IQ takes it a step further by notifying all available agents of a high-potential inbound lead and connects the first agent who responds. Admins have complete control over which leads are distributed by this program and what agents receive the calls. Velocify Dial-IQ is an outbound-only auto dialer only and does not offer inbound calling capabilities. Businesses that want an auto dialer with an inbound call center package should check out ChaseData, Five9 or Voicent. Velocify Dial-IQ’s coaching and training tools help refine agent performance, enhance the onboarding experience, and improve quality assurance. This feature is also available at ChaseData in the Professional and Enterprise tier levels and at Voicent for an additional charge above the base plan. Velocify Dial-IQ integrates with Salesforce and offers Salesforce1 mobile compatibility as an advanced feature. The auto dialer’s system integration is much more limited and what you’ll find at Five9 and PhoneBurner. Like ChaseData, Five9, Voicent and PhoneBurner, Velocify Dial-IQ has an online knowledge base available for customer reference. The company also offers email assistance and phone support. Since Velocify is designed for lead building and management, it’s not packed with features that address the auto dialer needs of companies across a range of industries from fundraising organizations that need integration with constituent management software to live chat tools for order processing. Businesses looking for features like progressive and predictive dialing or a variety of agent management tools may want to stick with options like CallHub or ChaseData. Velocify Dial-IQ customer reviews online have generally positive things to say about the auto dialer company. Customers say it’s easy to set up and use and organizes leads very well. However, some customers report customer service can be slow to respond at times. Businesses that need a lead management auto dialer built for sales teams should check out Velocify. The company offers a free demo of its product and an extensive resource library sorted by industry. Check out Velocify’s website for details. Voicent is a full-featured auto dialer software platform with a menu of a la carte choices for growing companies. Optional add-ons to the base package include an inbound call center package, call center manager software, workflow automation and more. Voicent is a good choice for companies that want an auto dialer solution that can grow with them. Voicent prices are $29 per agent, per month for monthly plans or $19 per agent, per month for yearly agreements. The base plan includes automatic dialer technology and an agent dashboard. Voicent pricing is initially lower than industry averages but can add up quickly once options like email campaign tools workflow automation tools are added. Voicent customers can select a variety of options like call automation or inbound calling tools to add to their base auto dialer and calling plan. That could save a company hundreds of dollars per month compared to plans from PhoneBurner and Five9 that come bundled with features like CRM integration or lead filtering tools customers may not use. Voicent’s base package includes predictive, progressive, power and auto dialers at no additional cost, making this solution a good choice for companies that need call automation. ChaseData charges extra for predictive dialing, and PhoneBurner doesn’t offer predictive, progressive, or preview dialers at all. This package includes interactive voice response tools, a business phone system, and virtual receptionist for an additional $15 per month. ChaseData also includes inbound calling tools at each tier level, but ChaseData’s packages are more expensive than Voicent’s. Voicent offers agent monitoring and recording tools, whisper coaching, agent reporting and tracking, and advanced call pacing algorithms for an additional $15 per month above the base plan price. Coaching and management tools are included in Velocify Dial-IQ’s package and in ChaseData’s Professional and Enterprise tier levels. Unlike ChaseData and PhoneBurner, Voicent does not offer systems integrations tools with its base plan. However, customers are allowed 50,000 CRM records per user. For more records per user, customers are required to upgrade to a custom or enterprise-level plan. Voicent has an extensive online knowledge base, in-product walkthroughs, video resources, and an online customer support ticketing system. The company also offers four tiers of paid training and setup support ranging from a one-time purchase fee of $149 to $499, depending on the level of service. Voicent doesn’t offer reporting, analytics or lead management tools found in other auto dialer products on the market. Businesses that need those features are better served by one the other options on this list of best auto dialer software. Voicent customer reviews online have positive things to say about the company, particularly about the company’s customer service. They also believe the service is a good value for the money. We didn’t see any negative reports or reviews of the company during our search. Business owners who want an auto dialer that can scale as the company grows should consider Voicent. The company offers a free trial and an online demo to learn more about the product. Visit Voicent’s website for details. PhoneBurner is an auto dialer that integrates seamlessly with Salesforce, HubSpot and Zapier. It also has an open API that companies can use to design their own software connections. We believe PhoneBurner is an excellent choice for businesses that rely heavily on CRM tools for cold calling leads and moving interested prospects seamlessly through the sales pipeline. PhoneBurner pricing is based on how many users are on the account. A single user is $149 per month while 50 users are billed at $74.50 each. More than 50 users require a quote from a consultant. The single-user price is on par with similar product’s higher-end plans. PhoneBurner auto dialer includes call automation but lacks Velocify Dial-IQ’s inbound lead call routing feature. It offers systems integration with Zapier and Salesforce, much like the upper tiers of ChaseData. PhoneBurner also includes call tracking, analytics and recording but, unlike Voicent, doesn’t charge extra. PhoneBurner automates calling tasks like manual dialing, personalized follow-up emails and post-call notes so agents can move through calls quickly. PhoneBurner also drops prerecorded emails with one click to eliminate time wasted waiting for the beep. PhoneBurner is an outbound-only auto dialer and does not offer inbound calling capabilities. Businesses that want an auto dialer with an inbound call center package should check out ChaseData, Five9 or Voicent. PhoneBurner’s dedicated admin portal lets you add, remove and edit seats, pull real-time reports and manage leads directly inside. Admins can also build self-updating real-time motivational leaderboards to broadcast directly to teams. For companies that already have a CRM system, PhoneBurner integrates with Zapier and the Classic and Lightning editions of Salesforce. A flexible developer API allows customers to connect other existing software to PhoneBurner to launch dial sessions. This is helpful for companies that want lead management but don’t already have a system in place. PhoneBurner has an online knowledge base, live support chat, email support, an online support ticketing system and phone support 6 a.m. to 5 p.m. Pacific time, Monday through Friday. Real-time status alerts also let customers know if PhoneBurner is experiencing slowdowns or downtime. PhoneBurner doesn’t offer predictive, progressive or preview dialers as part of its service. ChaseData or Five9 would better serve businesses that need that functionality. Online reviews of PhoneBurner are overall positive. Customers say there are no hidden charges or fees, and that it works as advertised. However, some customers say setup was a bit tricky. Organizations that want an auto dialer that integrates with sales CRM should take a look at PhoneBurner. The company offers a free trial to potential customers who want to try before they buy. Check out PhoneBurner’s website for details. CallHub is an auto dialer service designed to connect nonprofits and advocacy groups. Integration with virtual phone banking a pay-as-you-go price structure keeps organizations within budget. We believe CallHub is the right choice for businesses that use temporary phone banking for fundraising or other short-term campaigns. CallHub’s pay-as-you-go pricing is based on 30-second billing increments. Outbound United States calls are 14 cents and inbound are 12 cents. There are no setup or subscription fees. CallHub’s pricing is low compared to similar services; however, it also lacks features like call routing and training tools those services offer. Nonprofits, advocacy groups and fundraising organizations often work with volunteers, short-term staff, and use temporary phone-banks. CallHub’s pay-as-you-go pricing structure and free, unlimited agent accounts and integration with CiviCRM make CallHub a great choice. PhoneBurner, ChaseData or Five9 are better choices for companies with permanent staffing needs and sales outreach strategies. CallHub offers inbound calling for short message system (SMS) text message response but doesn’t offer inbound call center tools or features. Businesses that want an auto dialer with an inbound call center package should check out ChaseData, Five9 or Voicent. CallHub’s agent management tools allow admins to assemble agents and volunteers into an unlimited configuration of teams and assign teams into calling campaigns as needed. Unlike many other auto dialer services, agents and volunteers can be grouped under a single team name or organized into discrete groups to work on different tasks. CallHub’s call automation tools include predictive, power and preview dialers. Voicent offers the same dialers as part of its base package, but it costs more than CallHub. PhoneBurner doesn’t offer the three dialers at all, and ChaseData charges extra for predictive dialing. Like ChaseData and Five9, CallHub integrates with several business applications, including Salesforce, Zapier. However, CallHub is the only auto dialer on this list to also integrate with popular fundraising CRM platform CiviCRM. CallHub offers 24-hour email support on weekdays with a guaranteed 99 percent response time. The company also has an online how-to and FAQ section, although not as robust as support options at auto dialer services like ChaseData or Voicent. CallHub fall short in its customer support and online documentation. That could be a deal breaker for advocacy groups, nonprofit organizations and volunteer organizations that often lack the resources for internal tech support of their own. Online reviews of CallHub are generally positive. Customers say it’s a good value for the money, and it’s easy to set up calling campaigns. However, some customers report an occasional drop in call quality. Nonprofits and businesses that use fundraising software like CiviCRM should consider CallHub. The company offers four free online video demo viewable at any time. Customers can also contact CallHub via its website to schedule a live demo to see the product in action. Auto dialer software does more than dial a list of phone numbers. It also plays recorded messages, connects calls to sales agents, provides analytics, integrates with CRM platforms and collects call data to help train sales agents. A good auto dialer software solution should also provide excellent customer support. 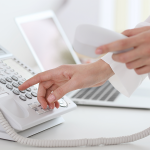 The best auto dialer software depends on what you need it to do for your business. Small businesses that want a comprehensive auto dialer at a competitive price can’t miss with ChaseData. Visit ChaseData’s website to check out a product demo and get a free trial of its auto dialer. Great post on Auto Dialer! Wanted to know what do you think about LeadsRain’s Auto Dialer? Is it worth the shot? We haven’t reviewed LeadsRain thoroughly but it looks like a solid product that shares a lot of the same features as the auto dialers on our list. We’ll keep it in mind to look at more closely the next time we update this article. I prefer to use a completely online service. roboshout is awesome. I don’t have to put any stupid software on my computer or anything. It’s pretty simple and easy. Thanks for sharing this silly option with our readers! I myself would hate to get 1000 texts. Thanks Mr. Tariq for appreciating ICTBroadcast! You will be happy to know that we also offer ICTBroadcast Service Provider edition, which can be used to launch your own hosted / cloud platform for great broadcasting services, And billing features in ICTBroadcast will allow you to sell broadcasting services and VoIP minute. Wanted to know what do you think about CallBlaze.co? Unfortunately there isn’t any pricing information available. However, the features listed include voice broadcasting, direct-to-voicemail calling service, auto-attendant/IVR system, and a sales lead service. I don’t see anything about preview, progressive or predictive dialing. Give your reps the info they need BEFORE they dial!